Our ice cream bikes are also available to attend your School or Parish Fete, Sporting event, infact any event on a retail basis. Whether it be a school or village fayre, or a party indoors or outdoors our bikes look great adorned with coloured bunting and will attract many customers. We normally attend on a no charge basis and then pass a percentage of our takings to you at the end of the event. We attend with 4 or 5 ice cream flavours and a freezer full of ice lollies! 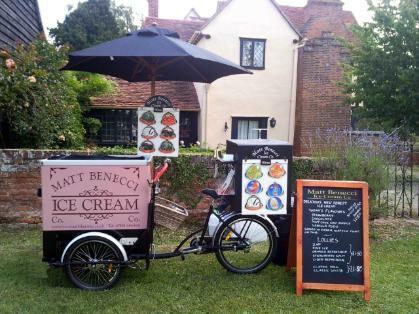 Talk to us if you would like to hire an ice cream bike only and serve your guests yourself. We can supply the ice cream, cones and sauces or simply leave the bike with you for the day. We'll always come up with a deal for you! Our ice cream bikes will be a highlight of your event! Contact us today to see if we are available.